The 8x8 display seems to startup correctly, but the yellow diodes, D0, D2, D3, D4 light-up. My son tells me that correct behaviour is D0, D1, D2, D3 should light-up. If we start playing anyway, circular button labelled b1 or "A" has no effect. Other circular button (b0 or "B") shoots as expected and the four square buttons on left also work as expected. After a few seconds the game ends (because "A" cannot used to play) and yellow diodes start a running display. All diodes light up except D1. The connections below diode D1 and button "A" look ok.
We have a multi-meter but don't know what to look for to debug these issues. The correct behavior on startup is that D0, D1, D2, D3, and D4 should light up. So, it's not that some of your LEDs are shifted, it's just that one of them is not lighting up. Check the soldering at that LED location, and at the pins of the LED driver chips. Also make sure that that D1 is installed with the correct orientation. Check the soldering at button "A" (aka location b1 on the circuit board) and the corresponding pin of the microcontroller, which is the pin located directly above the hole labeled PC1. The LED D1 issue is resolvable because I tried spare LED that came with the kit with temporary connections and it worked fine. 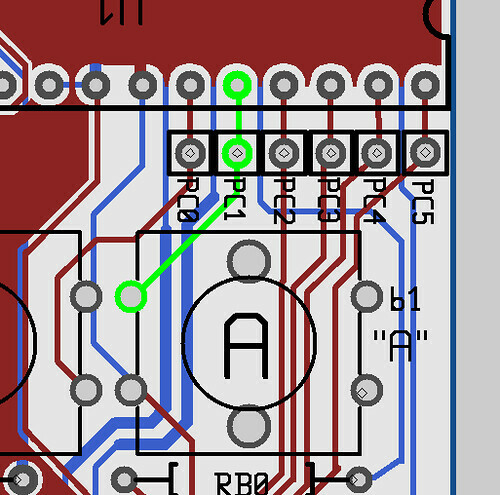 When I solder the good LED onto the board, this issue will get resolved. Comparing this to button b0 (which works), the voltage is 4.3V at two of its connections when not pressed and goes to 0 when pressed. That sounds like correct behaviour. What can I do to resolve issue with button b1 ? If you managed to damage the first LED D1 when you soldered it in, you may want to be a little more gentle with your soldering-- those don't usually fail. 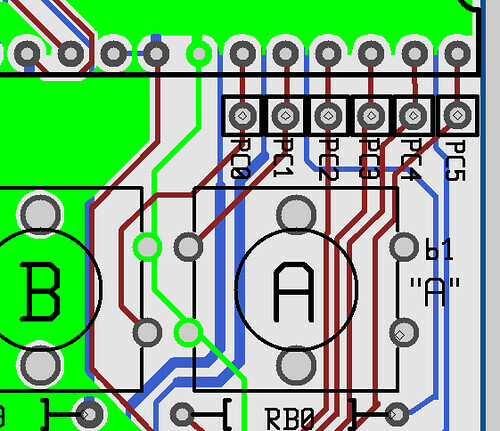 One pin of button b1 is connected to ground. Check to see if it is actually connected, say to the pin to the left of PC0. Then, check to see if this pin is electrically connected to the PC0 when the button is and is not pressed. Thanks for your help. I think I am closer to making it work. A pin of b1 is supposed to be grouned by a connection on the board to a ground pin of b0. This connection on the board is not working. The ground pin of b0 is actually grounded but the ground pin of b1 is not. When I connect these two pins by a temporary connection, switch b1 starts working as expected. So I am going make this connection permanent by soldering a short wire above the back of this board between these two pins. Is that the right thing to do ? Yes, that sounds like what I'd do.